Richard Devine’s 2018 album, Sort\Lave, is a new turn for an artist who’s been on the frontiers of electronic music for 20 years. It’s his first album to feature analogue modular synths, which give a different texture to the immersively ambient, tonally-splintered tracks that have made his name in progressive electronic music. He’s used dozens of different MIDI instruments for projects that range from tracks (like his remix of Aphex Twin’s Come to Daddy) to commercial sound design work for Google, Apple, and Omnisphere. Richard's favorite controllers for producing on-the-go are the Seaboard Block, OP-1 and the Lightpad Block. Richard Devine: I first came across the Seaboard RISE two years ago in the studio of BT, who I’ve worked with on a bunch of movies and remixes. As a sound designer I’m always looking for new ways to manipulate sound — really any kind of controller where I can assign and use as many parameters as possible. Brian [Transeau, aka BT] showed it to me, and I was blown away. It’s radically different from anything I’d laid my hands on. I loaded up Equator, and I said “Whoa, this is crazy”. It’s this multidimensional expressive sound tool with endless modulation. I stayed with the Seaboard, and it’s still pretty much my go-to keyboard, just because it’s more expressive. RD: I’ve been working with modular synths like the Endorphin Shuttle, and I’ve never found such an interesting controller for them. It makes everything instantaneous and hands-on, like you’re sculpting voltage clay. For my sound design work, I’m using ROLI stuff every day — the Seaboard Block, Lightpad Block, and Live Block. Lots of my sound design ends up being done on these Blocks because I’m travelling, and they’re so small I can take them everywhere. I take the Seaboard Block, my OP-1, and a Macbook to work on the road, my hotel room, airport coffee shops. When I’m on a plane I have two Lightpads. One is for fader movements and effects signals, and the other is just for playing stuff. They’re the perfect size. They fit on either side of the trackpad, almost like they’re built in to the Macbook for playability and triggerability. RD: I design user interaction sounds for Google. I’ve worked on sounds for Apple’s sound engines over the years — I’m a huge Alchemy user. And I’ve worked on the sound library for Omnisphere, which I love using with the Seaboard RISE. Recently I created all the sounds for Jaguar’s I-PACE electric car — including the ignition sound for the “engine”, blinker sounds, system navigation and so on. I used the Seaboard alot on the Jaguar project. RD: I’m always looking for something that gives me the edge over someone else, that lets me do something that other isn’t possible otherwise. There are endless numbers of keyboard controllers from the NI, Novation, and many other companies. They all involve pretty much the same things: keys, buttons, pads. The same thing over and over. That’s fine, and the industry’s used to it. But I always like companies that think outside the box and push forward to new territory. Richard Devine's home studio in Atlanta, Georgia. 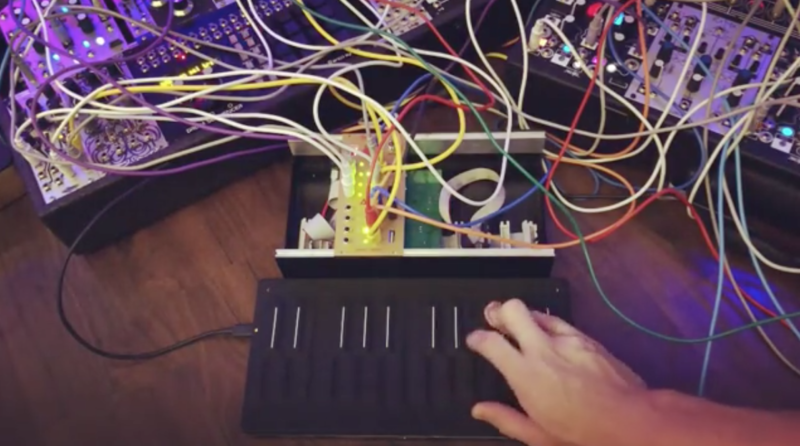 Controlling the Endorphin Shuttle modular synth with the Seaboard Block. RD: I like using modular synths because you build your own custom system, then things happen spontaneously and you’re taken down a path where you didn’t think you’d go. The interaction and feedback you get in that environment is incredible. In a way, it’s similar to what happens where you’re using a ROLI instrument. You can get lost in creating patches, and find these crazy sweet spots. You’re working spontaneously, which makes everything better because you surprise yourself: Whoa, listen to that! So it pretty much blew my mind when I connected the Seaboard Block to my Endorphin Shuttle. Everything’s so responsive, I don’t even know how to describe it. Watch Richard Devine control Endorphin Shuttle with the Seaboard Block. RD: I’m working on a new album that will be different to anything I’ve ever done before. Working at Google since 2016, I’ve been inspired by the work of Douglas Eck on the Magenta project, which is applying machine learning algorithms to music composition. My idea for the album comes partly from that. I’ll build a sequencer for making music in Max MSP, and create a hybrid record where Max is doing most of the sequencing. It will sequence out to various hardware: some modular and some like the Nord G2. The Seaboard RISE will be the interface in to Max. After I've built the sequencer, the machine learning objects in Max will take over. Machine learning gets better the more inputs you give it and the more you reward it for making the right decision. So what will happen if I deliberately confuse this algorithm by rewarding it when does something sonically crazy? How will it compensate? I’m really intrigued to see what will emerge from this wild new process, especially at a time when machine learning is affecting so much of how we live. Richard Devine’s new album, Sort\Lave, is now available on Spotify and Apple Music.